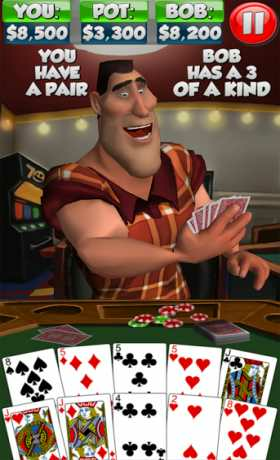 “Poker With Bob” is a draw poker game like no other! 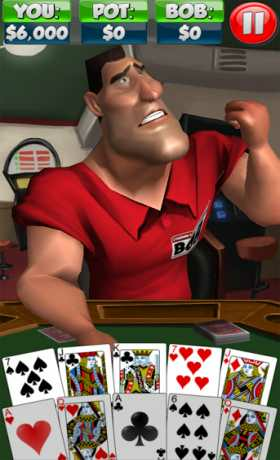 The player faces off against Bob, a real time, fully animated 3d character loaded up with several minutes of lip synced animation. He rants and raves when he loses and taunts the player mercilessly when he wins. >Five different levels of increasing challenge and higher stakes. >Career earnings! Keep playing to see how much you can earn. 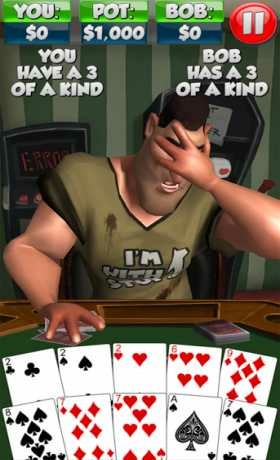 >A full tutorial to help anyone pick up the game of draw poker in no time. >Online multiplayer. Play against friends or random matches. Your choice! >Online leaderboards. Compete against the world to see who is truly the best poker player. “POKER WITH BOB” Featured in Apple’s “NEW AND NOTEWORTHY”!!!!!! SECOND BEST SELLING CARD APP IN ITUNES!!!! SECOND BEST SELLING CASINO APP IN ITUNES!!!! RANKED #43 IN SALES FOR ALL GAMES!!! RANKED #69 IN SALES FOR ALL APPS!! !